An onslaught of data breaches has forced health care organizations to be more cognizant of having response teams at the ready. Acute myocardial infarction and coronary artery bypass graft surgery are poised to join a growing list of conditions and procedures for which bundled payments will be mandatory. Conducting an information asset inventory is not only good business practice, it also can help organizations comply with security standards. The agency has called out diagnosis-related groups in two specific areas as subject to greater scrutiny due to previous findings of inappropriate payments. 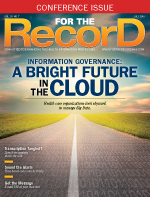 Data sharing is key to the future of clinical research. 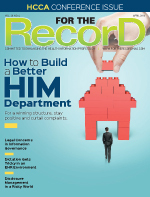 The regulations governing medical record retention often leave HIM directors perplexed, a situation that becomes even more complicated in an electronic environment. By answering a series of true-false questions, experts lend insight into what may and may not occur in the health care industry over the next 12 months. Recently, the federal government introduced metrics to support specific indicators of widespread interoperability. Covered entities and their business associates must familiarize themselves with the requirements and recommendations for HIPAA-compliant file sharing. 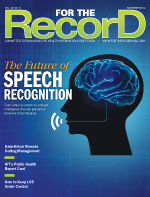 New advancements promise to make speech recognition technology more interactive. Using data analysis to measure productivity trends can help both coding managers and coders themselves. Key hurdles must be cleared if data sharing during a public health crisis is to become commonplace. Without strong documentation, hospitals run the risk of incurring severe length-of-stay penalties. A recent study compared technology use at urban and rural health care facilities. Prehire assessments and continuing education programs can help organizations maintain a fully staffed, fully functional HIM department. Turns out that the history of medical documentation is a case of copy and paste. Technology can be a great asset, but health care organizations must ensure that it is properly integrated into workflow. A hospital charged a mother $39 to hold her newborn. Is that "codeable"? 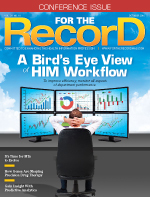 Mapping, dashboards, and process diagrams can lead to efficiency gains in the HIM department. Unleashing the power of Big Data can help providers identify the best course of treatment. The study of how genes affect an individual's response to a particular drug treatment, pharmacogenomics has the potential to be a health care game-changer. Industry experts say medical transcriptionists would be wise to adapt their skills to the latest technologies. As outsourcing coding services grows in popularity, it's time the industry established pricing and quality standards. With new health care initiatives almost outnumbering political ads these days, it's important that HIM makes its presence known throughout the organization. A recent survey of health care professionals measured how Wi-Fi impacts facility operations and promotes better patient care. CIOs and HIM managers are increasing the value of clinical imaging by collaborating on enterprisewide strategies. Frustrations are mounting as Part C payments come under intense scrutiny. Squarely in the crosshairs of cyber attackers, the health care industry must be proactive to keep data out of the wrong hands. It takes a keen eye and familiarity with compliance regulations to fulfill legal requests for medical records. By encouraging the development of communities of practice, organizations can create a learning environment. Fall's arrival brings many changes, not the least of which are the adjustments made to ICD-10. Enterprise content management can help eliminate EHR holes. Smart health care organizations will implement six best practices to stay compliant with informed consent guidelines. The federal government is taking steps to ensure HIT safety concerns remain top of mind. Earlier this year, the latest definition of sepsis dropped, a development with far-reaching effects. Although IT faces the brunt of the responsibility, risk managers also play a key role. Covered entities and their business associates are put under the microscope in phase 2 of the HIPAA audits. The movement to deploy scribes in documentation settings continues to gain steam. Christine Bechtel, coordinator of the GetMyHealthData campaign, explains how the initiative plans to change the health care landscape. Before the health care industry shoots to master precision medicine, perhaps it should better define the term. The new codes have brought with them a series of documentation challenges. Are you considering working remotely? An industry veteran offers tips on how best to make the transition. Up in the cloud, complicated IG processes can be streamlined, but caveats apply. Minimizing the time between a patient encounter and documentation can add richer detail. Reporting outpatient time-based CPT codes may seem straightforward, but that's hardly the case. Commonplace though it may be, sending an e-mail containing patient information can't be taken lightly. 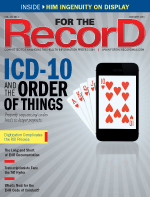 The transition to ICD-10 may be in the rearview mirror, but smart organizations are keeping an eye on the road ahead. Multiple clinical coding schemes and data transmission standards are hampering health care's efforts to take full advantage of Big Data. New York and Maine have demonstrated how ePrescribing can be an effective tool in the battle to prevent opioid abuse. Experienced industry professionals answer readers' coding conundrums. For clues on how to improve care coordination, the health care industry doesn't have to look any further than social networking sites. 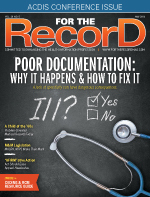 Analysis of EHR documentation can provide insights to help improve patient outcomes. More health care organizations are hopping on the outsourcing bandwagon. Nearly one-half of the hospitals surveyed by The Joint Commission fail to demonstrate complete and accurate medical records. The future is bright for anyone interested in joining the ranks of this expanding field. A CEO wants to see HIT focus more on innovation. A partnership between a medical transcription service organization and a software developer has resulted in a new dictation tool for physicians. A revenue cycle expert shares her thoughts on what constitutes a first-rate financial analytics team. Learn how the OpenNotes project has expanded its reach to the far Northwest. Engaging patients through text messages and other smartphone applications can benefit both patients and healthcare providers. Health care organizations must ascertain the former and then execute the latter. These acronyms are the latest to cause a stir in the health care industry. Anyone involved with claim denials is anxiously awaiting word from the Senate on the Audit & Appeal Fairness, Integrity, and Reforms in Medicare Act. A concept born in the early 1960s, the problem-oriented medical record provides a different view into a patient's history. Clinical process measurement can lend valuable insights into why specific care episodes are lacking. To match the industry itself, coder training is forever evolving, with new trends emerging this year and beyond. Health care organizations and vendors that enter into joint agreements to develop software and other technology face a series of legal concerns about ownership. In the coming months, auditors are likely to target eight specific areas for potential denials. A serious attitude adjustment can do wonders for efficiency rates and create a synergy with long-lasting effects. By taking a few key steps, health care organizations can be more confident that their clinicians will dictate properly in an EMR environment. To build an effective program, health care organizations must lean on the expertise of general counsel. 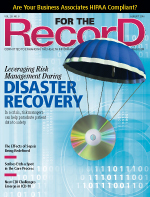 Now more than ever, health care organizations must be prepared in the event of a data breach. An in-house study conducted by M*Modal examines the effects of natural language understanding on discharge summary documentation. Find out how AMIA is attempting to make a difference in the nation's capital. In a passionate letter, a longtime medical transcriptionist says the state of the industry has caused her to call it a career. A recent study from CDW Healthcare takes the pulse of patients and providers on the state of patient engagement. Data integrity issues can be resolved by automating documentation, coding, and reporting processes. Organizations must think long and hard about whether to hire permanent staff or seek help from consultants. 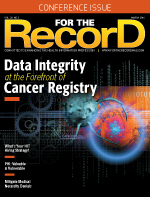 Any meaningful cancer registry must be built on a comprehensive foundation of quality control. 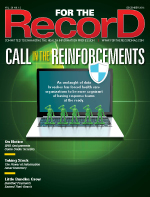 With multiple uses and shaky defenses, health care data continue to entice cyber criminals. 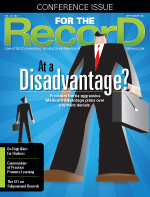 ICD-10 has brought with it renewed concerns about managing medical necessity requirements. Are data based on ICD codes flawed? An industry veteran believes that's the case, raising doubts about any initiative that leans on large data banks. With incidences of medical identity theft on the rise, it's important that staff be aware of possible warning signs. Now more than ever, competent coders and CDI specialists are essential. Organizations can combine their unique skill sets to develop longstanding relationships. Universal device standardization remains out of reach, making middleware a key component to data gathering. Without proper documentation and coding, hospitals face serious financial setbacks should they misrepresent patient cases. Usability, privacy, and quality issues take center stage as new apps and platforms emerge. Connecting providers and a cultural readjustment are two keys to a successful initiative. Learn valuable insight on the initial steps in launching an information governance inititative. Evidence-based practice centers enable hospitals to smartly answer questions to improve quality of care and patient safety. Industry veteran June Bronnert, RHIA, CCS, CCS-P, answers questions about coding's future and the aftereffects of ICD-10. A study analyzes how physicians conduct searches on their mobile devices at the point of care. Five years ago, Precyse issued a report on what HIM will look like in 2016. Let's examine their hits and misses. 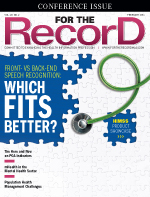 To ensure proper reimbursement, codes must be sequenced properly. In response to an increasingly electronic environment, AHIOS has issued a revised report on the steps involved in releasing health information. University of Missouri researchers take stock of physician attitudes toward electronic notes. Two health care organizations have created innovative systems to more efficiently review medical records. A successful enterprise imaging implementation requires uniform data sets. According to several reports, HIT leaders are in short supply these days. Learn what it takes to step into the next generation of C-suite roles. 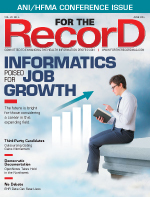 A survey of health care documentation specialists sheds light on the pressures being faced to meet dwindling turnaround times. An HIT advisor offers suggestions on what may be the next steps in the evolution of the EHR Developer Code of Conduct.